February is here and the sun is making its way higher in the sky with sunrise and sunset getting further apart everyday. This is also being heralded with a stir in one of our most loved wetland animals – The Common Frog. To mark the emergence of frogs IPCC are encouraging citizen scientists to take part in the hop to it frog survey. Ireland has only one species of frog (which is one of only three amphibians that are found here) and they hibernate within the coldest months. As the temperature rises this creature will leave its hibernation home (under a damp compost heap, within a muddy burrow or at the bottom of a pond) in search of food. As tadpoles they generally feed on algae and plant detritus but become fully carnivorous once they have their fully grown legs. Frogs are not sexually mature until they are 2 or 3 years old but can live in the wild up to 14 years. ‘Last year we received 116 records to add to our database of frog sightings with the first frogspawn sighting on the 1st of January and the first adult frog sighting on the 4th of January. The sightings are a few days later this year with our first adult frog record being sent to us on the 15th of January from Kilkenny’, said Tristram Whyte – Conservation Policy Officer with the IPCC. ‘I use information on frogs to help me make informed decisions about the quality of wetland habitats when investigating different planning applications. Frogs can be used as a good indicator of a pollution free environment’, he added. The population is very susceptible to changes in the environment but given the right conditions can become numerous locally quite quickly. 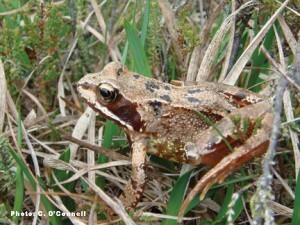 Peatland is a very important habitat for frogs as it provides everything they need. Insects for food, clean water, pools for mating and sphagnum hummocks to hide in. This entry was posted in News and tagged Bogs, February, Frogs, IPCC, Lullymore, World wetlands day. Bookmark the permalink.